Scientific Name(s): Rhododendron calophytum Franch. It seems next week will see the appearance of the first significant span of freezing temperatures this winter in our region. Snow isn’t in the immediate forecast, so I won’t have the opportunity to improve upon this photograph, but the cold temperatures will likely be enough to start the seasonal leaf-rolling and -drooping of many of UBC Botanical Garden’s rhododendrons. Rhododendron calophytum, or beauty-face rhododendron, is one of these species. 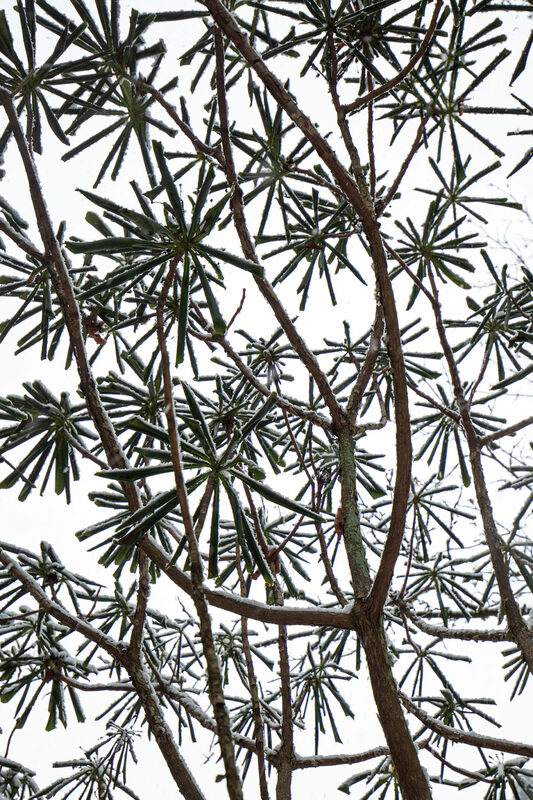 While most of the rhododendrons that leaf-curl and droop are shrubby, one can stand underneath the tree-like Rhododendron calophytum and marvel at the phenomena from a different perspective, perhaps with the briefest of cold kisses of snowflakes on one’s cheeks as was occurring at the time of this photograph. If you are wondering the reason behind these phenomena, the science doesn’t seem to be settled according to a write-up from last year on In Defense of Plants: Why Do Rhododendron Leaves Droop and Curl in the Winter?. Theories for leaf-droop include reducing snow load, preventing dessication by water loss (both now mostly discounted, though the latter is what I had assumed for many years), and preventing damage from a purported increased intensity of sunlight (for rhododendrons, which are typically shaded the rest of the year) and consequential photosynthetic activity in the winter. The latter hypothesis speculates that despite the leaf tissues being mostly dormant in winter, parts of the photosynthetic process are still being activated, but unable to complete–and the energy being captured does harm to cellular structures rather than benefiting the plant overall. The article also notes leaf-curl seems to have an independent reason for occurring; curled leaves are likely a means to prevent cellular damage from daily thaw-freeze cycles, by slowing the rate of thawing (as less of the leaf is exposed to the sun). Read more on these properties of rhododendron leaves in Arnoldia, in a 1990 article by Erik Nilsen: Why do Rhododendron leaves curl? (PDF). Thank you, Daniel, for your enlightening information. I look forward to your photos. I am a master gardener in Victoria B.C., and am challenging myself to complete the advanced m.g. courses .within the next few years. This site has been informative with excellent photos and information. This is a stunning photograph ! I’ve been missing you. So happy you have returned. In the article it mentions the use of Rhododendron leaves as a weather/temperature gauge- does anyone happen to know what temperature the leaves start to droop/curl and what temperature the leaves go back to their former positions? Would be interesting to find out! I don’t know how severe the winds are in winter in the native region of these rhododendrons but I imagine they are potentially damaging. If the deciduous canopy is no longer protecting them could it be that the reduced cross-section lowers the wind drag sufficiently to be beneficial to the plant? Are the leaf-stalks still stiff or more loose than when the leaf is horizontal? I would swear they curl tighter as the temperature drops below 20 degrees F.